Deal of the Day - Save 50% when you subscribe! Deal of the Day – Save 50% & M&S gift card when you subscribe! FOR one day only, subscribe to Britain’s brightest weekly gardening magazine and save a huge 50% on the full subscription rate plus receive a free M&S Voucher! Click the image NOW to take up this great offer! 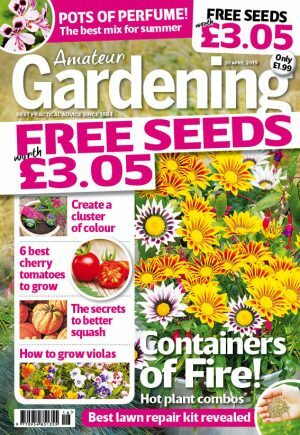 A subscription to Amateur Gardening provides you with the best practical gardening techniques in easy to follow step-by-step images. As well as providing all the latest news in the gardening world and the things you should be doing in your garden each season. Amateur Gardening is written by enthusiasts and experts. Our staff garden both for a living and for fun, and our expert contributors are some of the wisest in the business. Including Toby Buckland, Peter Seabrook, Christine Walkden, Bob Flowerdew and Anne Swithinbank. Take out a subscription to our colourful magazineand you’ll begin to see why Amateur Gardening is the first choice for so many keen gardeners – and has been since 1884. So don’t delay, this offer is only limited to today – CLICK NOW TO SAVE 50%! !